This is one view of our backyard fall decor this year.We usually decorate the front of our home for fall but with countless people walking the trail behind our home, I felt it would be seen and appreciated by many more along the trail who also might enjoy autumn. 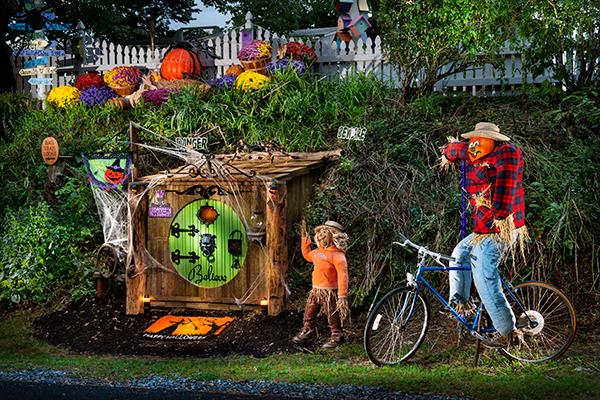 I arranged some mums,pumpkins and made a scarecrow figure riding a bike along with a youngster waving to trail users. Everything accents my hobbit hole creation complete with spider webs and a witch door mat. The bike rider was a logistical nightmare to get him to sit stable but a few 2x4s and some screws and he is rock solid. 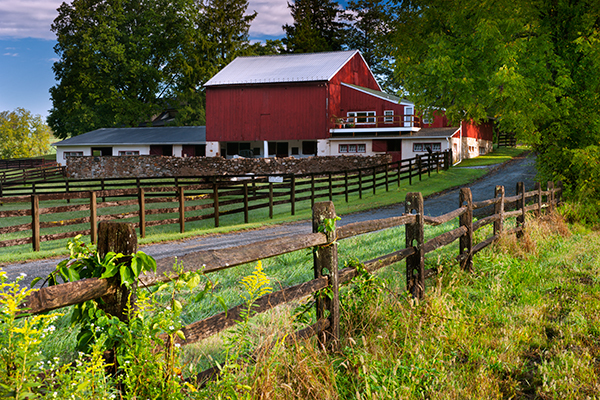 A rustic fence provides a pleasing foreground element for this back road farm. 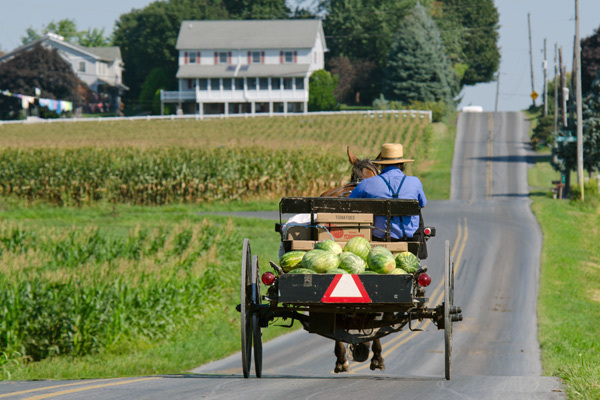 A buggy load of watermelons heads to a local market. 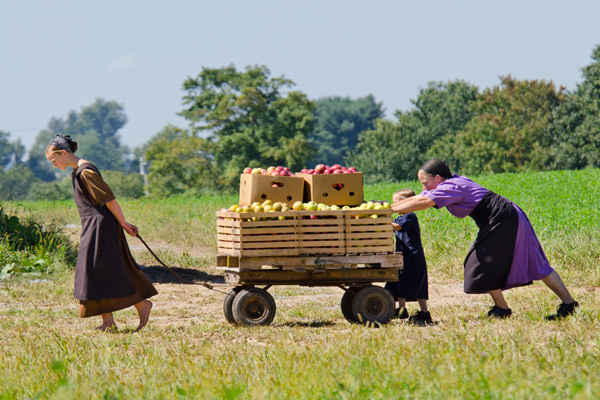 I noticed these three Amish girls picking apples in an orchard a good distance from the road, and even using a 400mm,I knew they were at my limit to get a good shot and they were also among the trees making it hard to see them. 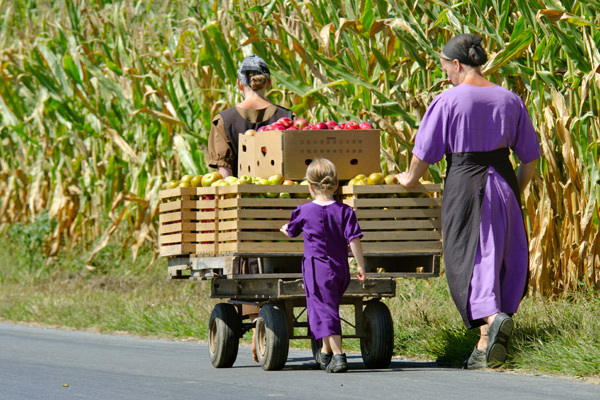 I watched about 5 minutes and suddenly they unloaded the whole wagon and start picking more apples making me think this was not going to be a day for apple photos. I said to myself,just wait five minutes and see what happens,and lo and behold they stop picking apples and load the wagon.They had no idea I was there and as they came out of the orchard I snapped the bottom photo and to my surprise they came down the road allowing me a closer shot. I did manage to cause a missed shot because the little girl was on top of the apples for a while but when her sister saw my camera she quickly pulled her off and it was so adorable to see her up there.I should have been more patient and waited a little longer. 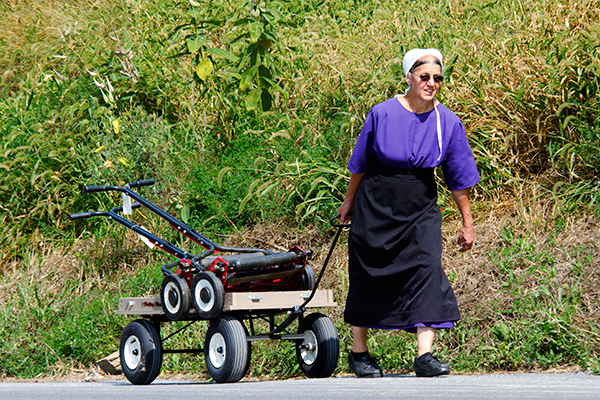 Two mowers get pulled in a wagon in rural Lancaster County. 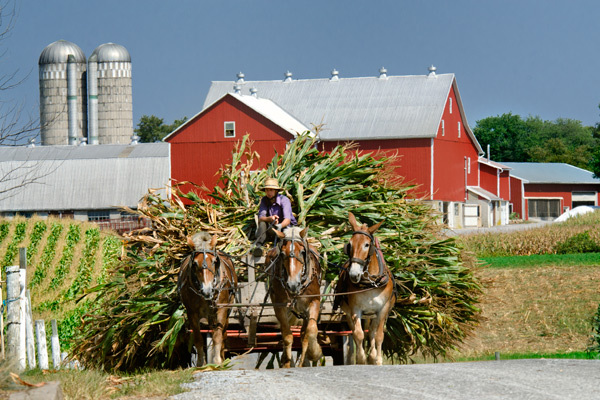 A wagon load of freshly harvested corn heads down the road leaving little room for any cars. The Amish have quite a system to keep moving as wagon after wagon keeps rotating from field to silo. 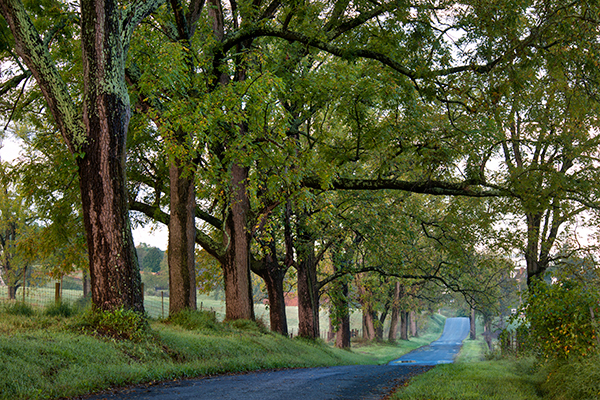 Been doing a bit of shooting in a neighboring county and I am enjoying finding new scenes on each trip. 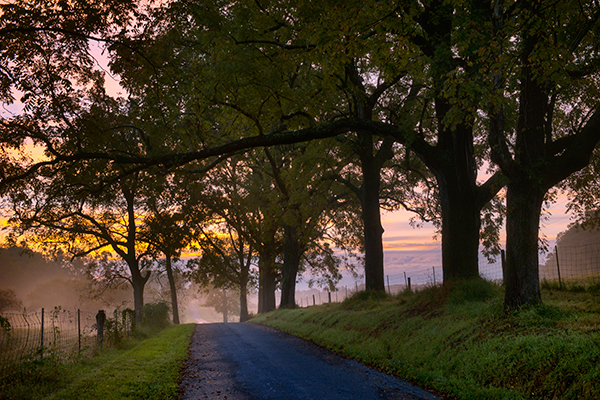 These two scenes were shot the same morning looking up and down the road from about the same spot. I love not having to deal with power lines in this area.